@Outsideness @AlbertBrenner1 There will be no 'reconciliation'. Life is blood and war. Win or die. 'Justice' is a fools errand. @PoseidonAwoke - so says those on top of socioeconomic hate machine. Pretty sure your Nazarene was all about peace. Ah, so now I'm on top of the socioeconomic hate machine because of my Will to Power over those who would destroy me and my brothers. I smell anti-racism and social justice, two ugly babies of Cultural Marxism. Anyone who uses the word hate to denounce the other is a Leftist. Among Leftists, Hate is overloaded to mean heresy, denoting any thoughts which a Leftist finds distasteful. My refusal to submit anti-racism may be the worst of the Leftist heresies. His use of the word socioeconomic is a reference to class, which is classic Marxism; as socioeconomic status is a primary division used in critical theory to divide oppressors and oppressed. The article that he defends even bemoans the dead end that critical race theory has encountered in South Africa. I'm sure that breaks BrightAbyss's heart too. You can read the thread, but the short of it is that BrightAbyss tries to pick up Christianity and use it as a moral club to beat me into submission to the Marxist ideology. Good luck with that. This approach fails miserably because I am not terribly philosophical, ideological or moralistic. I'm thedish. My consistency is in loyalty, loyalty to my in-group and to my thede (still working on phyle). I come from a long line of Christians. I can trace my lineage back the the Revolutionary War (really more of a secession, but that's for another time), and to a Christian doctor who was jailed, pilloried and had his ears cropped for criticizing the Anglican Church in England. "In this sign, you will conquer"
You see, unlike most Christians in America, I understand that the current state of Christianity as BrightAbyss (mis)understands it, is a watered down, Leftist shadow of its former glory. The reason for this is that for hundreds of years now Enlightenment philosophers have reformulated Christianity in Enlightenment terms and imbued it with Enlightenment values. 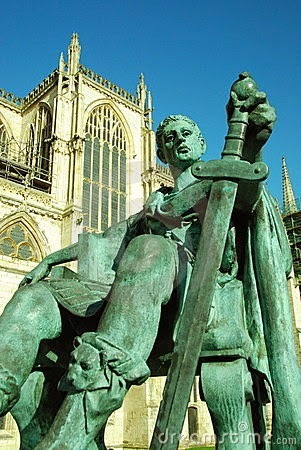 To the side is a bronze of Emperor Constantine, who conquered under the sign of the cross. Christianity has been the light of the West, and Westerners have bathed the world in blood to bring Christian peace. You see, paradoxically, peace is achieved through violence. Peace does not occur in Nature, because Nature is a Hobbesian war of all against all. Peace is unnatural, it is manufactured. Peace can only be manufactured by men who have the Will to Power. The West rose to power through the creation of Capitalism (an economic or social technology, in addition to other engineering technologies), a system which suppresses involuntary transfers of property, leaving no choice but to engage in the market. The Christian exhortation of men to behave peaceably, and to obey the authorities, has been extremely helpful in the creation of productive markets which lead to Western power. The Catholic church operated much as the House of Commons in modern systems, being the voice and advocate of the people to the Executive Branch function performed by the feudal lords, the Aristocracy. The story of the survival of Christianity through the Middle Ages, is the story of Aristocrats using violence, technology and economics to create and maintain walled gardens of civilization in a sea of barbarism. You see, Christianity only functions in a civilized society. The rules of Christianity only apply within that walled garden, they do not exist in the sea of barbarism. This is why Christians built walls around their tiny pockets of civilization, to specifically exclude the barbarians. Christianity is a social technology, but social technologies do not work with all peoples and in all times and places. We must use the right tool for the job. To our fellows within the walled garden, we turn the other cheek. To the barbarians on the other side of the wall, we pour down boiling pitch. Get the idea? Leftists are the barbarians, intent on tearing down the walls which keep our civilization safe. They are an infection, eating out our normative commons, dissolving norms of behavior, sowing discord and distrust in every corner. They subvert the Will to Power, spreading the lies listed in hacker hero Eric S. Raymond's Suicidalism and Gramscian damage posts, leading to a listless and defenseless Christianity. To a Progressive, 'true' Christianity means Christians doing whatever Progressives think Christians should do. Isn't that convenient? We Christians have been fools. We have been too trusting. We have allowed snakes in our midst to spread lies and discontent. We have treated our enemies as though they are Christians, rather than as the barbarians and destroyers of Christian virtue that they truly are. Christians have always been willing to fight, kill and die for their civilizations. I am no different. Leftists like BrightAbyss need to understand this: it is Christian forgiveness for those inside the wall, and boiling pitch for those outside of it. Many modern Christians have lost the Will to Power, but my eyes are open: Peace is forged through Power. Even "Turning the other cheek" refers to a reaction to personal insult not personal assault.